As summer draws to a close, 2015's '70s trend rages on, encouraging fashion mavens to sport their far-out bohemian frocks, mod corduroy minis, and most significantly, flared jeans. However, sporting flared jeans is easier said than done, unless you wish to appear as if your lower half is being devoured by denim. With their exaggerated silhouette and floor-grazing length, flared jeans are exceptionally tricky to sport in a manner that appears balanced. And while a tucked-in blouson top or tee will do wonders in terms of offsetting bell bottom jeans, the true key to rocking flares is the right pair of shoes. In simpler terms, your appointed footwear can make or break a flared denim ensemble. As flared jeans are tailored to fall from the knee at a slight angle to just above the ground, the most important factor to consider when choosing shoes to pair with your pair is heel height. Towering heels too high for your jeans will disrupt the line from your knee to the ground, revealing too much of your shoe and causing your legs to appear shorter. By contrast, flats and other shorter footwear can cause flared denim to haphazardly drag on the ground and lend a lazy appearance to your ensemble. If you're on the hunt for the ideal footwear to couple with your trendy flared denim, look no further than these seven celebrity-favored styles. A notorious proponent of denim in all of its many forms, Jessica Simpson aces flared denim ensembles by pairing her jeans with platform wedges. Platform wedges maintain the casual aesthetic of medium wash flared jeans while providing added height to the floor-grazing hem. The style is fetching, peeking out from underneath flares. If an elongated leg is the silhouette you seek, look no further than pointed-toe pumps. Flared jeans cause the eye to travel in a straight line from your waist or knee to toe, and a pointed heel simply adds to the illusion of possessing legs for miles. As Sofia Vergara so cunningly demonstrates, a simple platform heel concealed by a bell bottom jean cuff lends height to your frame without revealing the source of the added inches. As flared denim accentuates the body's natural curves, adding a sultry peep toe heel to the ensemble simply increases the sensuality of an ensemble. Model Hilary Rhoda's pick additionally injects a note of luxury into the look with woven, gilded straps. Perhaps the most bohemian of the mix — and the truest to the original '70s trend — heeled clogs and flared jeans are a sartorial match made in heaven. 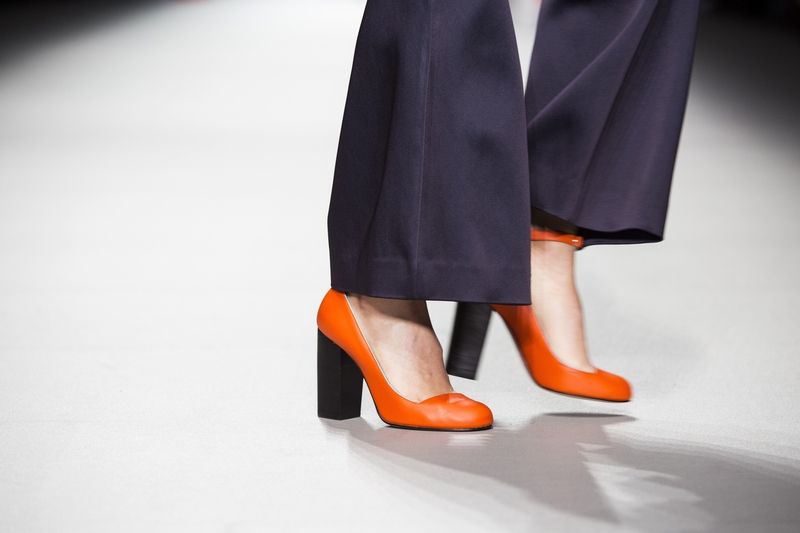 The shoe's comfortable fit, insouciant appearance, and elevation add an indie vibe to flares. Much like pointed-toe heels, pointed-toe boots are incredibly impactful when matched with bell bottom jeans. For additional aesthetic oomph, coordinate the hue of your denim to the hue of your boots. Slightly less harsh in silhouette than a pointed toe, an almond toe boot evokes a relaxed, vintage-inspired vibe that is utilitarian yet timeless. Furthermore, an oval toe shoe recalls the look of couture cowboy boots for those who wish to channel their inner maverick.